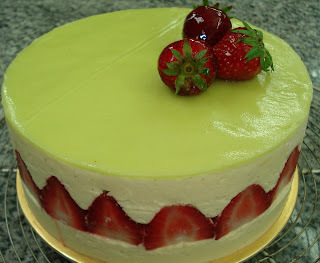 Sponge cake was used as the base. Strawberries were cut in half and arranged along the sides. Whole strawberries were used to fill the middle. It was masked with mousseline cream. 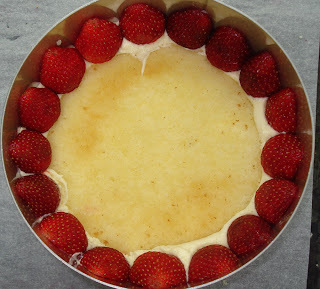 Tip: Bad strawberries will affect the shelf life of cake so refrain from using them. We were given two choices for the cover, Italian meringue and marzipan. I chose the latter and added a few drops of green food color in it. 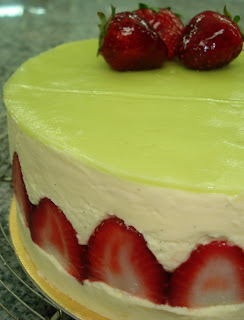 As for me, the combination of green marzipan, red strawberries and white mousseline cream was very appealing. Putting the ice cream directly on to the plate is a no-no. The heat that comes from the plate melts the ice cream. (See mine?). It is advised to place it on something like a tile biscuit before putting it on a plate. Lesson learned. 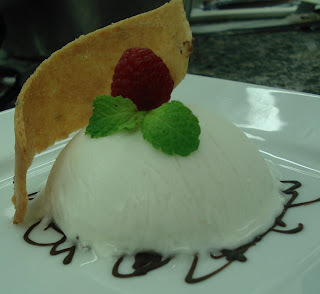 Ice cream decorated with tile biscuit, raspberry and mint. Chocolate soft cake. Dry outside but gooey in the inside. 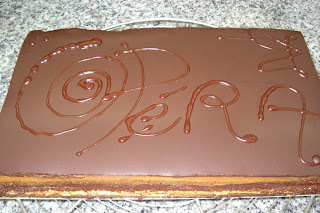 Three layers of Joconde sponge cake sandwiching coffee butter cream and ganache. We topped it with cocoa glaze. 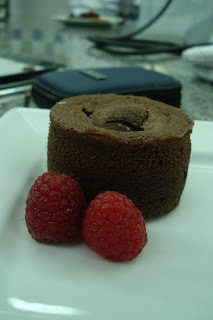 The taste of coffee overpowered the chocolate flavor. I wasn't quite pleased with it but it would perfectly suit the fancy of coffee lovers.